Bernie Sanders confronts Trump nominee for Education Secy. Education Secretary Betsy DeVos told CBS she thinks arming teachers "should be an option for states and communities to consider," following a mass shooting last month at a high school in Florida where a gunman killed 17 and injured at least 17. "I hesitate to think of, like, my first-grade teacher, Mrs. Zorhoff, I couldn't ever imagine her having a gun and being trained in that way," DeVos told 60 Minutes' Lesley Stahl in an interview that aired Sunday. "But for those who are – who are capable, this is one solution that can and should be considered. But no one size fits all. Every state and every community is going to address this issue in a different way." DeVos also said she's been picked to lead a task force exploring steps to prevent violence at schools, and that there is an urgency to make changes. "See, there are a lot of states that are addressing these issues in very cohesive and coherent ways," she said. The federal government has expanded its power in almost every policy area, but in no issue has that overreach been more damaging than in education. After four decades of profligate spending and onerous regulations, the great achievement of the U.S. Department of Education has been in sustaining the mediocrity of the status quo. Earlier this week, Secretary of Education Betsy DeVos rightly identified the problem—the centralization of education policy decision-making in Washington. 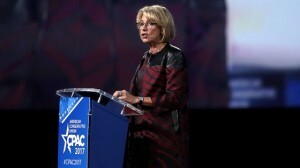 Though DeVos’ speech was short on specifics, she nonetheless provided some principles for reform that bode well for the nation’s 60 million schoolchildren. First, the president and Congress must begin a steady devolvement of power from DC to the states, where most policy-making power—especially on education—resides. In practical terms, that means that states should drive education choice. DeVos’ articulation of a reinvigorated federalism is sorely needed in a department whose constitutional merits are questionable at best. Consequently, the administration is correct that we must simultaneously downsize the Department of Education while also nurturing a policy climate in which state take the lead in policy innovation. Given the maturity of the parental choice movement—more than 30 states have enacted some type of educational choice program—fostering such a role would likely spur a bevy of choices and opportunities for America’s schoolchildren. The good news is that the administration can thread the proverbial needle by taking action in three school systems which the federal government oversees: the federal district of Washington, D.C., which has approximately 90,000 students in public schools, public charters, and private schools; Bureau of Indian Affairs schools (48,000 students in 183 schools across the country); and students of U.S. military personnel (approximately 200,000 students). Offering these families the most modern form of parental choice—an education savings account—would give them educational opportunities that transcend the one-size-fits-all model of the current public school system. In sum, education reformers are rightly excited about the prospects for proper federal action in education policy. 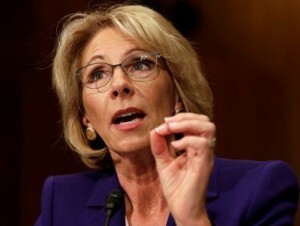 If the administration follows the precepts of Secretary DeVos’ address—and can find a sufficient number of allies in Congress who put children ahead of the system—the Department of Education may finally have found its proper role.